December 14, 2014 - Celebrate the holidays with the 126 Army Band in concert at the Belmont Armory. The performance begins promptly at 1:00 p.m. Sunday, December 14th at 1650 House Street in Belmont. Admission is free, so bring the whole family! December 16, 2014 - Drop your kids off and head to the mall for the 2nd annual Drop & Shop event. The Child & Youth Program, along with the 4-H Military Partnership Team, will be hosting our 2nd Annual Drop & Shop! There are 5 locations across the state. These events are free but pre-registration is required! February 7, 2015 - The 63rd Brigade presents the Grand Rapids Military Ball, a joint service celebration. The ball will be held at the Amway Grand Plaza Hotel in the Ambassador Ballroom. Social hour begins at 5:30 p.m. For more detailed information and registration, visit the event page. 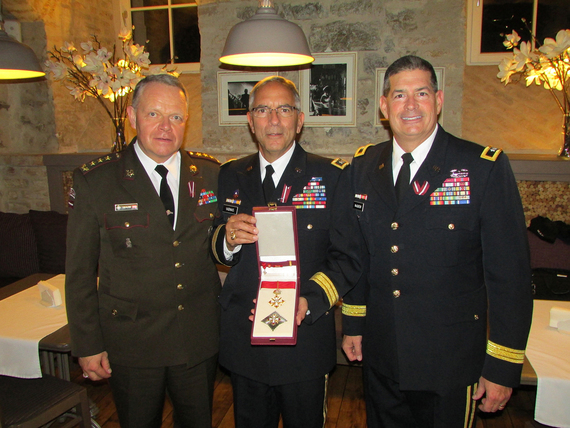 LANSING, Mich. — This month, Maj. Gen. Gregory J. Vadnais, the adjutant general of the Michigan National Guard and director of the Department of Military and Veteran’s Affairs was awarded the Order of Viesturs Second Class, from Latvian President Andris Bērziņš, at a ceremony in Riga, Latvia. Latvia has been Michigan’s partner in the Departments of State and Defense and National Guard Bureau sponsored State Partnership Program since 1993 when Latvia began their transition to a citizen-based military after years of Soviet occupation and no national military establishment. The Order of Viesturs award was established in 1938 in commemoration of ancient Latvian military might and was reinstated in 2004 after Latvia’s accession to NATO in 2004. The motto for the order translates in English to “Be Strong in Battle!” Bērziņš presented the award to Vadnais for his leadership in bilateral military cooperation between the United States and Latvia and in recognition of Michigan National Guard support in strengthening Latvian Defense Force capabilities. While in Latvia, Vadnais and other senior leaders participated in a ribbon cutting ceremony for an advanced joint terminal attack controller training system. According to Senior Master Sgt. Jeffrey Matheney, a JTAC assigned to the Grayling, Mich., based Air Gunnery Range, the Joint Terminal Attack Controller Simulator has multiple computers that run JTAC scenarios such as rotary and fixed wing close-air support, artillery-fire support and naval gunfire training. The scenarios are effective to help the JTAC learn in any given situation, how to communicate to pilots in the aircraft in a real-world event. "The simulator allows JTAC to rehearse before going in the field or to prep for their advanced training. It can also count for required training currencies in a time when actual air sorties [flying missions] are limited,” said Matheney. “The system trains JTACs on tactics, techniques and procedures necessary in multiple combat situations." For more than two decades, the Michigan National Guard and the Latvian Defense Force have trained together. Between November 2008 and December 2010, Michigan and Latvian National Guard members became the first in the SPP program to deploy as an operational mentor and liaison team. The team served three nine-month tours in the mountains of Afghanistan in support of Operation Enduring Freedom. To enhance the Latvian’s ability to direct close air support and indirect fire, it was proposed that they develop joint terminal attack controller capabilities to ensure the OMLT had the required technical and communication expertise needed. Air Force Col. Andrew Roberts, the commander of the Michigan National Guard Grayling Air Gunnery Range in 2008, stated that Michigan led in the development of the training initiative. “Latvia was the first nation to join the JTAC training program with literally non existing Air Force capability,” said Roberts, who now serves as the commander at Alpena Combat Readiness Training Center, in Alpena, Mich. Heavy emphasis was put on the JTAC program and the Latvian program received full certification in 2010. To date, many Latvians Defense Force members are U.S., JTAC certified by Michigan Guardsmen assigned to the Alpena, Combat Readiness Training Center. Since 1993, troops from the Michigan National Guard and Latvia have participated in many military-to-military engagements in support of defense security goals. Michigan and Latvian leaders, Soldiers and Airmen visit and train in the U.S., and Latvia as committed partnership participants. The JTAC training that began in 2008 is continuing to materialize and strengthen both countries' wartime capability. We regret to inform you of the passing of some of our own. We make every effort to stay in touch with our Guard family long after they leave service, but it isn't always possible. We know how important it is to know when fellow retirees pass; so we are requesting your help. If you know of a Michigan National Guard veteran who has passed away, please report it here. John Leo Percha - John Leo Percha, age 80 of Brooklyn passed away on November 29, 2014 at Allegiance Health and now rests in the arms of his Lord and Savior with many preceded family and friends. Terry James Menard - Terry James Menard, age 63, of Sugar Island, Mich. passed away Wednesday, November 19, 2014 at War Memorial Hospital as a result of an automobile accident. Robert W. Greenwood - Robert W. Greenwood, Sr, 89, of Cheboygan, MI passed away November 8, 2014 surrounded by loving family. Richard Rann - Retired Air Force Brig. Gen. Richard Rann of Charlotte, passed away Thursday, Oct. 9, 2014 at the age of 90 after a short illness. Alvin Eugene Kelly - Alvin Eugene Kelly (Kieliszewski), 85, of Alpena passed away at Tendercare Greenview on Tuesday, November 4, 2014. William "Bill" Stephens - First Sgt. William "Bill" Stephens passed away in his East Lansing home on Thursday, October 30, 2014. Stephens served in the 46th Military Police Company, Michigan Army National Guard from 1978 to 1990. Edward "Chum" Leask - Edward "Chum" Leask died on Wednesday, October 29th, 2014. Leask served in the Michigan National Guard from 1950 - 1981 and was a resident of Sault Ste. Marie at the time of his passing.